Fierce Diva Fitness: It's SO Not The Fat Gene That's Making YOU Fat! He he he.... you are telling it like it is! Funny and true post! I think its amazing the way "science" has found a way to blame everything on our genes- from obesity to alcoholism and drug abuse, it's all about our predispositions. Thanks for posting this and encouraging people to do something about it now! Check out this picture of Michael Angelo's David if it happened to be in America. Thanks for visiting, Health Nut. I agree. Every year, they come up with a new "addiction". After a while, you have to stop blaming your biology or genetics and just be accountable! That's helping a lot especially me gain more weight recently (I spent more time in front of pc ).. no exercise. To be honest, my family are in intermediate body size category - not skinny and not too fat. But I tried not to gain more weight as I passing 30s.. Interesting, funny and knowledgeable at same time here. As they say, hate obesity and not obese people. Very good read! It is too easy to get fat and it isn’t quite so easy to do something about it. But easiest of all is to find excuses as to why you are fat, as opposed to looking yourself straight in the face and saying I eat a lot of crap and don’t do any exercise. This is a very cute, unfortuantely true post, thanks for the smiles! Is there a gene that causes me to sing Milli Vanilli songs? Daddycool, get more active so you don't fall into that other category! I hear you completely, Sam! Fixing Gear, absolutely! I just want 'em to get healthy. The simple truth is that you're what you eat. Only few people actually have some medical problem that makes them gain fat even when they manage what they eat. 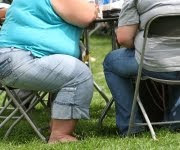 The majority are simply too lazy to exercise and burn the excess calories while others are addicted to eating because they have not found a better way of giving expression to their life. A lot of folks won't like this post, but then the truth must be told. It is amazing how many of us hide behind the excuses that we come up with about gaining weight. Plain and simple most of us need to be eating better and exercising more often.